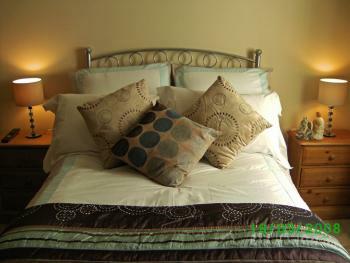 A twin bedded room with full ensuite facilities, tea and coffee making amenities and TV. The twin room is located on the second floor. Includes breakfast. A double bedded room with full ensuite facilities, tea and coffee making facilities and TV. Includes breakfast. Our aim at the Caraneal is to offer our guests a home-from-home. Ideally located just a short stroll along the seafront (5 minutes) will bring you to the Historic Plymouth Hoe and only 15 minutes to Town with its new shopping centre (Drakes Circus) or the vibrant Barbican, with its shops restaurants and bars. Parking outside is with the use of concessionary parking vouchers. A 2 minute drive will get you to the ferry terminal where you get a boat to Roscoff or Santander in Spain. The train station and bus stations are a short taxi ride away. 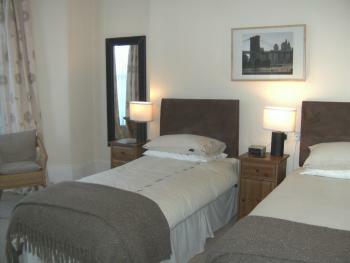 Whether you visit Plymouth for business or pleasure you are assured of a warm welcome. 3 ground-floor bedrooms, all en-suite with showers. Level access to shower rooms, shower trays 23 or 27cm high. I room has level access to breakfast-room, the others have 2 steps. Leave A38 at Marsh Mills and follow signs for City Centre. Take road signposted The Hoe and Seafront. Stay on seafront road until mini-roundabout at The Waterfront, then turn right into Pier Street. The Caraneal is on the left, second block, opposite children's playground. The easiest way is by taxi, a 5 minute journey. If you prefer to walk it would take approx 20 mins. Turn left from bus station, walk through the Barbican (Southside St) and follow the road along the seafront until the mini-roundabout at The Waterfront. Turn right into Pier Street.